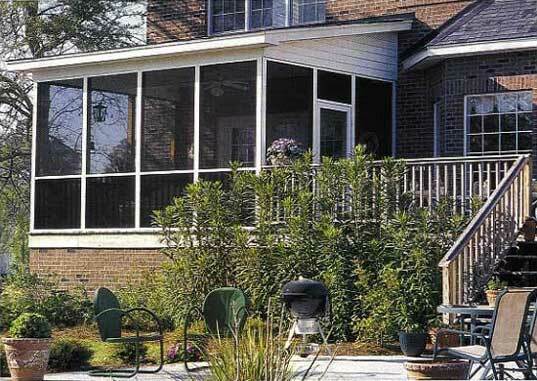 Screen Tight is the better way to replace or install porch screening. Article from Today’s Homeowner (now This Old House). By Joseph Truini. Photographs by Don Taylor. The traditional method of screening a porch has pretty much remained the same for a hundred years. That’s unfortunate, because it’s a flawed system. Small tacks or staples are used to attach the screening to the porch posts and railings. Then, narrow wood battens are nailed up to conceal all of the seams and fasteners. Screen Star: This renovated screen porch sports all new screening installed with the low-maintenance vinyl Screen Tight system. It’s a labor-intensive method, and screens installed this way typically develop noticeable sags after just a few months. Plus, when it’s necessary to replace a damaged screen or fix a sagging one, you must remove several battens and yank out about a million fasteners. But there is a much better and easier way to install screens, and it doesn’t require a lot of experience. 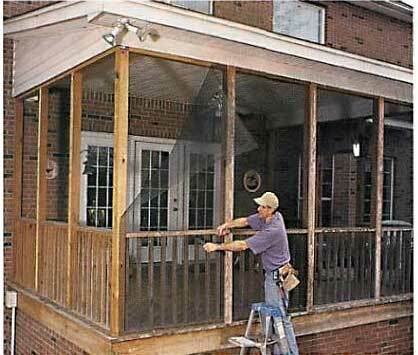 This “Weekend Project” will show you how to re-screen an existing porch using the Screen Tight screen porch system. You can use the same techniques detailed here for a DIY screening solution to new and remodeled patios, deck enclosures, breezeways and gazebos. Screen Tight is a cleverly designed, all-vinyl system that consists of two main components: a black base strip and a snap-on cap trim, which comes in white, grey, beige and brown.The base strip is screwed in place around the perimeter of each opening that will be screened. It comes in 8- and 12ft. lengths, and in two widths for attachment to 2×4 and 4×4 framing. Molded into the surface of the base strip are two grooves, which accept the rubber spline that secures the screen in place. Once the screens are installed, the cap trim is snapped on to conceal the base strip and screen spines. You can use either fiberglass or aluminum screening, although fiberglass is a better choice because it’s easier to handle, stretches tighter, and is less expensive. Fiberglass screening, sold at home centers and hardware stores, starts at 15 cents per square foot; aluminum costs 25 cents per square foot. 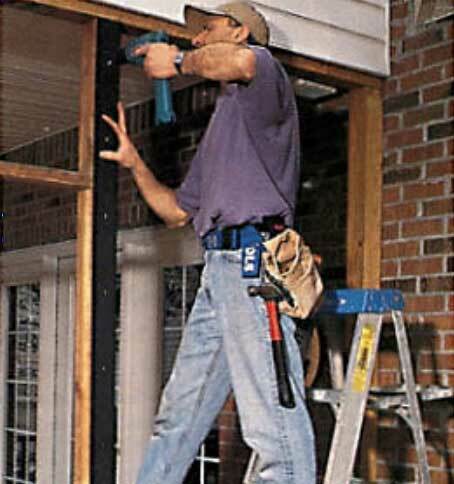 Start by using a hammer and flat bar to pry off all the wood battens nailed to the porch framing. On our porch, we removed the horizontal 1×2 battens first, then yanked off the vertical 1×4 battens that were nailed to the 4×4 posts. Once you have removed the battens, cut down the old screens with a utility knife. There will be many old tacks and staples left behind, which you can either pull out with pliers or tap flush with a hammer. We employed both methods to create flat, smooth surfaces. Pull down all the old screening and pound the staples flat. ther one in 2 in. from each end of the strip. The screws should be driven snug but not so tight that they deform the vinyl strips. Fasten the vertical base strips to the outside of the porch posts. Use the 3 ½ -in.-wide base for 4×4 posts. Use pruning shears or tin snips to trim the base strips to length. Screw 1 ½ -in.-wide base to 2×4 rails. Then, screw the horizontal base strips to the framing that spans between the vertical posts. Trim the strips to length with pruning shears. They can also be cut with tin snips, a hacksaw or a power miter saw. Install the remaining base strips, making sure to drive a screw through each slot and 2-in. from each end. Pull the screen fabric tight with one hand as you roll the spline into the groove of the base strip. We installed Phifer Wire’s standard black fiberglass insect screening in the openings above the handrail. Below the railings and on the porch door, we installed Phifer’s new PetScreen (55 to 68 cents per square foot), a durable material that resists tears and punctures from pet claws. This vinyl-coated polyester is much stronger that standard screening. Fiberglass and aluminum screening come in a variety of colors. However, black screening is typically the best choice for porches and doors because it’s less reflective and offers much better visibility than lighter colors, especially bare aluminum. Always install the top edge of the screen first, followed by the two sides and finally the bottom edge. Pull the screen taut wit one hand as you roll the spline into the groove with the splining tool. If you create a wrinkle or fold in the screen, pull out the spline and start again. When securing the bottom edge of the screen, check to make sure the screen is flat, wrinkle-free and relatively tight. If it isn’t drum-tight, don’t worry. When you snap on the cap trip, the screen will tighten up quite a bit. Trim off the excess screen with a sharp utility knife (Photo 6). Work slowly and with great caution; one small slip and you’ll slice open the new screen. Align the cap with the base strip, then strike it with a plastic or rubber mallet until it snap-locks into place. Use the same method to install horizontal cap trip along the top and bottom of the walls, and along the top and bottom of the walls, and along the handrails. Let these pieces run long, then trim them to length with pruning shears. Cut the narrow, horizontal cap trip to length with pruning shears after tapping it onto the base strip. 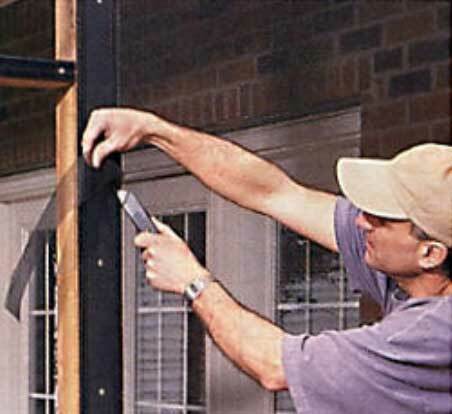 Cover the base strips and screen splines on the 4×4 porch posts with long pieces of wide cap Screen Tight trim. 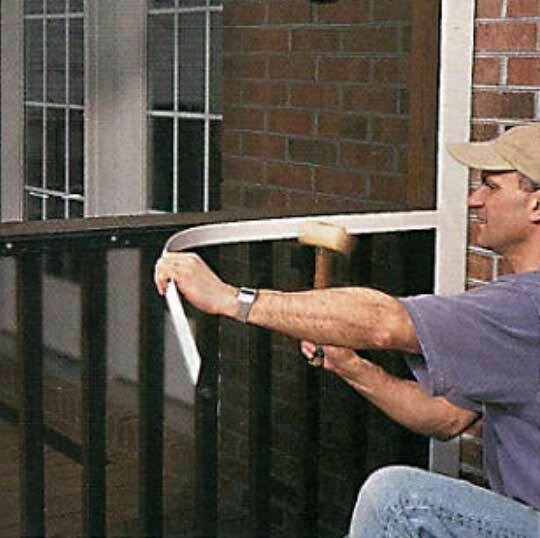 Use a non-marring mallet to tap the narrow cap trim onto the base strips that are screwed to the 2×4 railing. After screening in the upper portion of the porch wills, repeat the process on the lower half. If you’ve got a dog, or cat (or both), consider installing a more durable screening to the openings below the handrail and a screen door with a pet door built in. Once all the screening is up, install the cap trim, starting with the vertical pieces. After we completed screening in the porch, we hung the new vinyl screen door which perfectly matched the bright-white cap trim. Download PDF of original article. This entry was posted in News, Resource Articles and tagged Original Screen Tight System.